Many personal injury plaintiffs claim that hot air patient warming devices like 3M’s Bair Hugger may contaminate surgical sites with dangerous bacteria, leading to serious and catastrophic injuries. Unfortunately it is impossible to make the hospital surgical room sterile, and there are reports of serious infections following hip and knee replacement surgeries that may be linked to the use of Bair Hugger warming blanket. The forced-air warmers may cause bacteria from the operating room floor to enter the surgical site. Several lawsuits have been filed by patients who developed deep joint infections after hip or knee replacement surgery. The Dr. Shezad Malik Law Firm is currently investigating joint infection cases nationwide. If you or a loved one was diagnosed with a joint infection following hip or knee replacement surgery, you should contact our personal injury lawyer team immediately for a free case consultation. Please use the form to contact our Medical Device Lawsuit Group or call us toll-free 24 hours a day at 888-210-9693 ext. 2 or 214-390-3189. There are more than 50,000 of the Bair Hugger warming blankets in use, and according to experts, they are used during more than 80% of all hip replacement and knee replacement surgeries. The device maintains the patients body temperature and prevent hypothermia during lengthy surgeries. 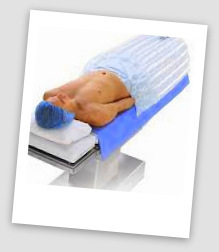 It works like an electric blanket, by forcing hot air into a blanket that is placed over the patient. What is the Problem With the Bair Hugger Device? The Bair Hugger may cause surgical infections by blowing bacteria-contaminated air into a patient’s open surgical wounds. The risk of infection may be increased in joint replacement surgery, particularly hip implant and knee implant surgeries. In a Kansas federal lawsuit, Timothy Johnson alleged that the Bair Hugger warming blanket caused Methicillin-resistant Staphylococcus aureus (MRSA) infection, leading to the amputation of his leg. About one in a hundred people who have joint replacement surgery develops an infection complication. This serious side effect must be treated with multiple surgeries to replace the implant, wash out the joint and tissues, and intravenous antibiotics. Dr. Shezad Malik Law Firm represents drug side effects and defective medical devices personal injury clients for claims, lawsuits and settlements nationwide.